Takamine’s presence in the mid-range is becoming more and more dominant. They are definitely not the only elite brand which is establishing a foothold in what can still be considered as an affordable segment of the market. With that said, they are one of the most active brands in said category. 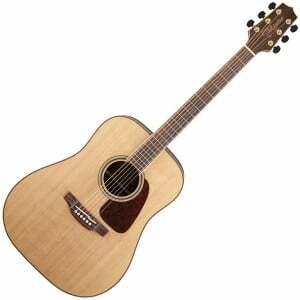 Takamine GD-93 is a perfect example of what they are capable of. GD-93 looks like something that belongs to a higher price range, and it sounds near as well too. It’s one of our favorite picks for under $500, along with other great guitars. To find out which ones we’re talking about, check out our brief list for more info. Takamine’s strong suit seems to be sticking to what is proven to work. 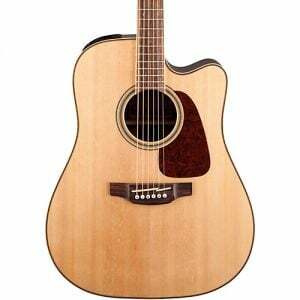 In the context of GD-93, they have designed a dreadnought made of a solid spruce top, which is paired with rosewood sides and a three-piece rosewood/quilt maple back. The neck is also a mahogany piece, featuring a nicely bound fingerboard. Speaking of which, the top is also bound. Add a minimalist rosette to the mix and you have a guitar that looks downright impressive. However, that’s not all Takamine GD-93 is capable of. Among the great things which make the GD-93 so competitive, the hardware is among the most obvious ones. Instead of taking the usual route, Takamine decided to go for a rosewood bridge that is fitted with a split saddle made of bone. The nut is also made of genuine bone, which is something we are going to see less and less in years to come. Takamine didn’t jump on the Tusq train, at least not in this segment of the market. Tuning machines come in form of a decent die cast set, which holds the key with a great level of accuracy. Although it isn’t anything new, the unusual combination of tonewood on Takamine GD-93 makes for a rather interesting tone color. You have that familiar mellow note coming from the spruce, while the rosewood and quilted maple join together to tighten everything down. With that said, there is still warmth in the mid and lower end of the frequency range. This type of tonal properties makes the GD-93 perfect for finger picking, but also a formidable contestant if strumming is more down your alley. Now when you put all this in context and compare the GD-93 with its immediate competition, you see that it’s a close race to the top. expectations. There isn’t really much more we can ask for without going into petty aesthetic details. However, if performance is all that matters, this is one of the best sounding dreadnoughts in for the money. 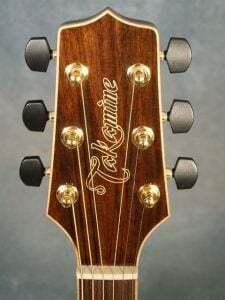 For more info about the Takamine GD93 NAT, click here. For more acoustic guitars for less then 500$, click here.